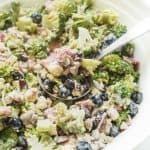 This healthy broccoli salad has a yogurt and almond butter dressing for a healthier fat profile and is filled with fresh anti-oxidant rich summer berries! For most people: good times at the lake, soaking up some sun, throwing a frisbee, meandering down trendy streets with gelato in hand, or enjoying a picnic in the park. I love all those things too! But for me, summer means berries! I don’t shell out the money to buy them at imported prices throughout the year. Too expensive, and they never taste as good as when they’re in season locally. So, when summer rolls around and the price of berries drop, I buy a LOT of berries. And I hardly ever cook or bake with them. They are just SO GOOD on their own that it almost seems like a waste to dilute them with other flavours. But, occasionally I go ahead and part with a few of my berries for a recipe. I love me a good broccoli salad and I had visions of making broccoli salad even tastier with flavour of almond butter and fresh berries. They say to follow your intuition and I believe it: this salad is out-of-this-world delicious! If you think the idea of berries and broccoli together sounds weird, you just have to take a leap of faith with me on this one. My husband was a bit weirded out too, but he trusts my cooking and kept an open mind. After a few bowls, he was hooked! Part of the healthfulness of the Mediterranean diet can be attributed to the anti-oxidants found in the myriad of fruits and vegetables. When anti-oxidants are freely available in the body, they neutralize the free radicals produced from everyday metabolic processes, environmental factors, alcohol, and some foods we eat. If free radicals are left unchecked, they can start to induce inflammation and damage to our bodies’ tissues. Broccoli, berries, seeds, and onions are great sources of anti-oxidants, so this salad is an anti-oxidant powerhouse! 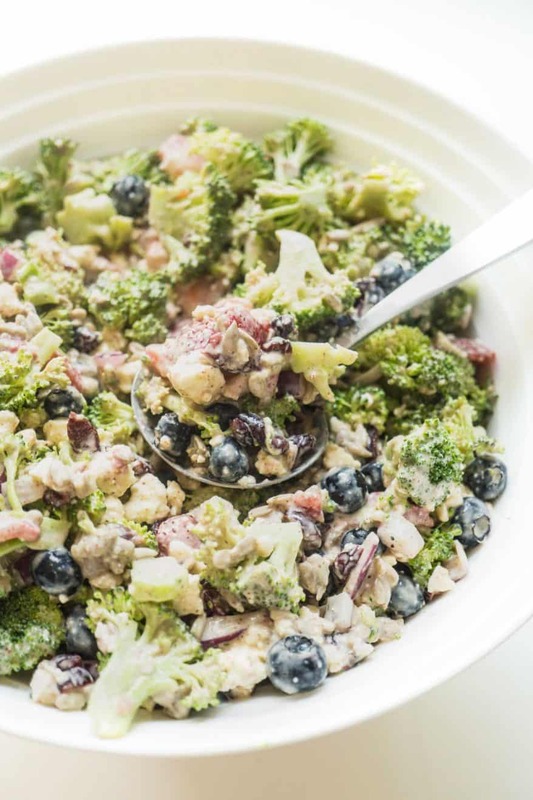 Place the broccoli, red onion, blueberries, strawberries, sunflower seeds, cranberries, and feta in a large bowl. Place all dressing ingredients in a blender or food processor. Blend to combine and chop the garlic. Alternatively, you could crush the garlic separately and whisk the dressing ingredients together. To make it more of a meal, add a grilled chicken breast to each person’s bowl! Serve with a side of toast.